For the first time ever you can watch the legendary Formula 1 champion's interview with Murray Walker on the stage of the 1991 AUTOSPORT Awards. This week the Senna movie was released on Blu-ray and DVD. To mark this occasion AUTOSPORT has trawled its archives and found some incredibly rare footage of the great man at our 1991 Awards. The then reigning world champion received a terrific ovation as he took to the stage of London's Grosvenor House Hotel in front of 800 members of the motorsport elite and was interviewed by another F1 legend - Murray Walker. It is an incredible and revealing piece of footage that lasts the best part of 15 minutes and has never been available to be viewed by the general public before. 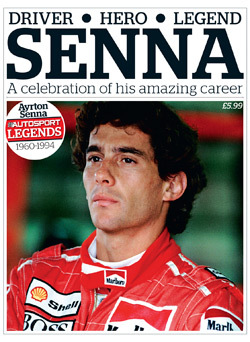 • AUTOSPORT's unrivalled archives have also contributed to a fantastic new bookazine Senna which comes out today - October 13. Featuring classic interviews, race reports and features, it also contains superb original work including technical reviews of his championship-winning F1 cars, a career appraisal by AUTOSPORT's star F1 writer Mark Hughes, and an amazing and emotional recollection of the tragic events of Imola 1994 by the other drivers who were on the grid.